Challenging Behaviour. As parents, we've all experienced it at one time or another and as children we've probably exhibited some as well. It's part of growing up. But for some children, challenging behaviour isn't just a passing phase and it spills over into every area of their lives, including school. The behaviour is sustained, often violent and unmanageable with many young people ending up permanently excluded or attending Pupil Referral Units. Most of these young people also have a special educational need or learning disability. For parents and the family as a whole it can be a devastating experience. A charity that helps children and families in this situation is the Challenging Behaviour Foundation and today, we have a guest post from Holly Dawson of the CBF explaining all about their work. The Challenging Behaviour Foundation (CBF) is the charity that supports people with severe learning disabilities and behaviour that challenges. Our vision is for children and adults with severe learning disabilities who display challenging behaviour to have the same life opportunities as everyone else. We’re making a difference to families’ lives by providing information, developing networks of peer support, running workshops, and influencing national policy. Anyone can display behaviour that challenges on occasion, as any parent of a two-year-old will know well! But whilst most children’s behaviour becomes less challenging after the ‘terrible twos’, it can be an ongoing difficulty, especially among children and adults with learning disabilities. This is especially true of people with severe learning disabilities, who have little or no speech, as well as finding it difficult to learn new skills and needing support with everyday activities. Challenging behaviour includes behaviours that are aggressive, self-injurious, stereotyped or disruptive. Common examples are hitting, head banging, and running away. The CBF was founded in 1997 by Viv Cooper, whose son, Daniel, has severe learning disabilities and behaviour described as challenging. Viv was motivated by her personal experiences to set up the Challenging Behaviour Foundation. Our identity as a family-led charity is still central to our vision and values 18 years on. Though our information sheets are no longer printed using a donated copier in a corner of Viv’s garage, our resources will always be free to family carers who want them. We listen to what families are saying to us, and their wants and wishes provide the backbone for our work in influencing policy. We have always strongly believed that driving change depends on collaboration between family carers, professionals, charities and organisations, and leading authorities. Our ultimate aim is that the CBF does not exist. We strive towards a world in which everyone gets the right support at an early age, without the need for the CBF. Although we have come a long way from our humble beginnings, there is a still a huge amount of work to be done before this vision is attained. Many family carers and professionals come to the CBF with specific questions about behaviour, care, rights and accessing services. We have developed, with family carers and professionals, information sheets covering a wide range of relevant topics. These are available free to download from our website, or can be ordered over the phone (contact details below). For those who need further support, we have a Family Support Team who provide telephone and email support to carers of people with severe learning disabilities and challenging behaviour. The Family Support Team can be contacted on support@thecbf.org.uk, or 0300 666 0126, during office hours. Please note that we only have one staff member working on Family Support each day, so they might not be able to get back to you immediately. Carers of people with severe learning disabilities and behaviour that challenges often tell us that they feel isolated and lonely. We have set up peer networks, so families can share advice and support with those who have had similar experiences. 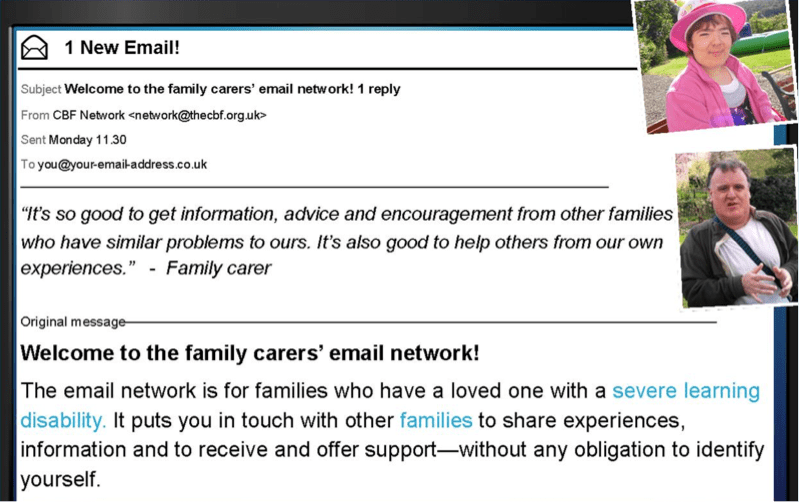 Our Family Carers’ Email Network allows family carers to ask questions and receive advice and support from other family carers in the network. The network is open to parents, siblings, grandparents, and even aunts or uncles – any family member who is support someone with a severe learning disability whose behaviour can challenge. All kinds of topics are discussed, from how to protect an iPad to understanding new policies. The email network is moderated by our Family Support Team and all questions and answers on it are anonymous; you can share information and experiences, and receive support, without any obligation to reply or to identify yourself. Being put in contact with other people who have been in a similar position has proved to be invaluable for many of the families who contact the CBF. 88% of family carers said they felt less isolated as a result of using the email network, and 85% said they were more confident in caring for their relative. To join the Family Carers’ Email Network, you can download a form from our website, email network@thecbf.org.uk, or call the office on 01634 838739. We also coordinate a Family Linking Scheme. For a lot of people who care for someone with severe learning disabilities and behaviour that challenges, a listening ear can make a real difference at times of stress and worry. The Family Linking Scheme matches family carers with a trained family carer Link Volunteer to speak to on the phone regularly. We try to match people based on the age of their relative and the kind of situation they are in. Link Volunteers are trained to provide emotional support. Having also ‘been there’, they may be able to offer information and useful ideas. To join the Family Linking Scheme, you can download a form from our website, email support@thecbf.org.uk, or call the office on 01634 838739. We are always looking for family carer volunteers to join our growing network of Link Volunteers and Local Champions around the country. To find out more about supporting other families and spreading the CBF word, email volunteering@thecbf.org.uk or go to the volunteering page of our website. If you would like to find out more about the work of the Challenging Behaviour Foundation, why not visit our website – www.challengingbehaviour.org.uk You can also contact our office with general enquiries on info@thecbf.org.uk, or by calling 01634 838739.